One of the most dreaded parts of any trip is deciding what to pack and how to get it to your destination. You want to make sure you bring everything you'll need without seeming like you've loaded up the entire contents of your home into your luggage. Exactly what items and clothing you will want to take with you on your Hawaii vacation will depend on the activities you're planning. And, if you're like most people, you'll probably overpack as you try to plan for every possibility. The following guidelines should help you to reach every traveler's goal: just the right things, only what you need, and no more. It all begins with a list. A good travel list is an ongoing project. While some of the items are specific to each trip, many of the items are things that you'll take on all of your Hawaii vacations or, for that matter, any vacation. A good idea is to keep a master list of the items that you take on each trip on your computer or smartphone. As a new trip approaches, you can copy that list, rename it for the trip at hand, and add to it the specific items you need for the upcoming vacation. Your list can also include things that you need to do around the house before you leave, such as water the plants, call the pet sitter, or hold the mail. As the day of departure arrives you should check your list to be sure that things are getting done and that you have located or purchased all of the items you need. The list is a great last-minute check before you leave the house to make sure that nothing has been forgotten. One of the most important things to remember is that when you're in Hawaii, you'll be outside much of the time—walking, riding, snorkeling, bicycling, sailing, strolling, boating, surfing, hiking, or swimming. For daytime, casual is definitely the way to go. With that in mind, you should be sure to prepare for the sun. The sun is strong nearer the equator. You don't want to start off your first few days with the discomfort of a sunburn. Bring a good suntan lotion as well as a hat. A collapsible hat packs very easily. Pack or wear comfortable footwear suitable for the activities you're planning, such as athletic shoes, hiking boots, sandals, or walking shoes. For clothing, men should be sure to bring polo shirts, T-shirts, and shorts. A pair of jeans or lightweight pants are a good idea for higher altitudes. For women, bring polo shirts, T-shirts, tank tops, shorts, and light-weight skirts or slacks. If you plan any water activities, pack at least two bathing suits. This way, you can wear one while the other is drying. Casual wear is an easy area in which to control overpacking. Consider doing a load or two of laundry during your vacation. Many condos and hotels have self-service laundromats. Call ahead to check on the availability of facilities. If you decide to go this route, set aside plenty of quarters during your vacation. Also, if you like to buy T-shirts as souvenirs, you can cut back on the number of tops you pack. You'll find plenty of choices everywhere in Hawaii, and most especially in the resort areas and around Waikiki. For dressier occasions such as business functions, a visit to a nice restaurant, or a night on the town, note that Hawaii's culture and its tropical climate have created a more relaxed dress code. With that in mind, you should pack business casual and resort casual wear, unless your company instructs you otherwise. For other occasions for which you want to dress up a bit, men can consider khakis or chinos (or other tropic-weight slacks) with loafers, polo or golf shirts, and perhaps a sport jacket. Women also can consider khakis or chinos, with a dressier top (with or without a tropic-weight jacket) and sandals, or a nice sundress and sandals. Although your fine jewelry can dress up a casual outfit, and takes little space in your luggage, it requires extra security precautions. Consider, instead, wearing just a few basic pieces. Hawaii's aloha-wear is also a good choice for both men and women. The styles available cover a broader range than the traditional muumuus and loud print shirts. It is widely available, and you will be joining in on the fun of the islands. Buying Hawaiian-made or sold jewelry provides a pretty souvenir you can enjoy year-round at home. There is a wide range available on the island, from inexpensive costume jewelry to both moderately priced and more expensive fine jewelry. Good grooming often requires a hair dryer or iron or both, but even travel sizes can add weight to your luggage. Check ahead with your hotel or condominium to see if they offer either or both of these items as amenities. You'll also want to plan for other items and clothing that will enhance your experience, based on activities you've planned, and the parts of the islands that you'll be visiting. While much of Hawaii's climate is tropical, higher elevations can be cool, especially at night. The summit of Haleakala (Maui), Volcanoes National Park (Big Island of Hawaii), and similar places can be breezy and cool at any season. You'll find a pair of jeans, or a light jacket, sweater, or sweatshirt quite comfortable in these situations. If you plan horseback riding, a long bike ride down Haleakala, or a hike in the upcountry, you will probably prefer long pants or jeans. Checking with any tour or activities guides with whom you've booked will also be helpful. They will be able to provide you with precise instructions on what you'll need to bring, and what equipment or special clothing is included with your package. For example, a stargazing tour on the Big Island will be cold, but rest assured that parkas, mittens, and hot beverages and soup are provided by the tour group. You don't have to bring everything that you'll need in Hawaii. You can decide to buy or rent some items when you arrive. 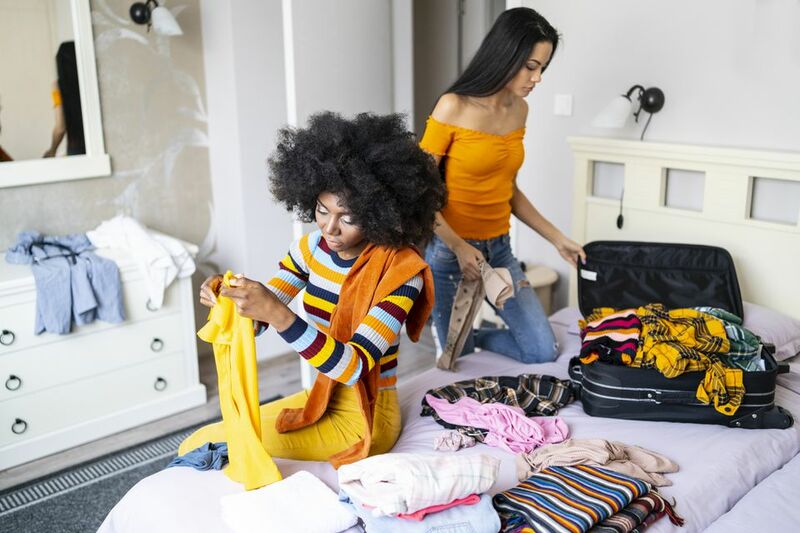 When deciding whether to pack something or not, keep in mind your vacation budget, the space available in your luggage, and the availability and price of goods in Hawaii. Because it is an island state, all goods must be shipped or flown in, making prices higher than on the mainland. You will be visiting the 50th state of the United States, and tourism is its major industry. For this reason, you should be able to purchase or rent just about any special item within easy driving distance of where you're are staying. In the more commercialized areas, dive shops, discount stores, drug stores, camera shops, grocery stores, and supermarkets abound. Items such as beachwear, camera batteries, office supplies, shampoo and conditioners, suntan lotion, and sunglasses are readily available. Specialized items such as scuba and snorkeling equipment, kayaks, surfboards, and even golf clubs are available for rental or purchase everywhere. However, if you'll be staying in some of the more remote parts of the islands, or on a less commercialized island such as Molokai, you may find the selection more limited. If you're a professional or amateur enthusiast with special equipment needs, you'll probably want to consider bringing most of your equipment with you. If you like to buy souvenirs of your vacations, always leave extra room in your luggage for your return trip. The crafts, artwork, and souvenirs available in Hawaii are extra tempting because they cover a broad range of cultures including Hawaiian, Polynesian, Chinese, Japanese, Portuguese, and much more. Your best option for any overflow may be to pack a collapsible bag or tote that would be both small enough to use as a carry-on, and sturdy enough to check should that be required. Any medications you take regularly as well as prescriptions for replacements in case they are lost or damaged. Health insurance cards, personal identification, and, if you are visiting from another country, your passport. If you intend to rent a car—your driver's license, auto insurance card, and confirmation document from the car rental company. Airline tickets, confirmation documentation from your condominium, hotel, bed and breakfast, or other pre-arranged lodging, confirmations for any pre-booked tours or activities, and any printed itineraries you may have received. User manuals for any new cameras or electronic equipment that you've purchased for your trip. You don't want to spend precious time struggling to use an unfamiliar feature. A toothbrush, toothpaste, extra change of underwear, socks, and shirt, and sleepwear will help to see you through if your luggage is delayed. A bathing suit and cover-up. If your luggage is delayed, you won't care, because you'll be lounging on the beach. It almost goes without saying that all valuables should be packed in your carry-on and not in your checked luggage. Items such as cameras, laptops, tablets, hand-held electronic games, video cameras, traveler's checks, and money should never be packed in your checked luggage.